Microsoft office has various tools which provide help to internet user. With the help of these utilities User can save their important data’s like email, attachment files, contacts, calendars reminders and appointment on hard disk of their computer system. These files are personal storage table files or PST files of Microsoft outlook software application where user can save all his important data. User must know if any trouble occurs in outlook software application that will result into data loss. Therefore it is said to keep their updated back up of data’s on external hard disk or memory drive. In case you lost your any important data or emails then you need to recover these emails as soon as possible. Here we will describe how Outlook emails lost and How to restore them easily. 2. Very common mistake of deleting PST files is using combination of “Shift + Delete”. 3. If there is no antivirus software or corrupted antivirus software on your system, many Virus and spams can enter to your computer which can delete your PST files. 4. Formatting and reformatting your computer hard drive may be a reason of outlook PST file loss. 5. If you are reinstalling or trying to install dual operating system without backing up data, that can be the reason of file loss. 6. Crashing of Operating system due to any unknown reason may lead your PST data to be loss. 7. In case of hard disk failure or using pirated operating system on your computer system can be the reason of Microsoft Outlook malfunction. To start the Inbox Repair tool manually, locate one of the folders by using Microsoft Windows Explorer, and then double-click the Scanpst.exe file. Note The file or folders may be hidden. For instructions about how to unhide files and folders, see your operating system documentation. In this Inbox Repair tool you have to type the path and the file name of your personal folders (.pst) file or click Browse to locate the file then click Start. You will see following dialog box where you can enter your .pst file name. After you run the Inbox Repair tool, you can start Outlook and recover repaired items. You have to make you new personal folder where you want to store recovered data. Now Start Microsoft Outlook. If you have multiple profiles in Outlook, then carefully select the profile where you want to store repair data. Then Press CTRL+6 to turn on List view of folders. Create a new Personal Folder (.pst) file in your profile. The steps may be different, depending on which version of Outlook you are running. But always remember Free Inbox Repair Tool cannot repair every deleted problem. If file is permanently deleted or corrupted, it cannot be repaired again. In that case you can try the third party application named Outlook PST recovery software, with the help of this application, you can get back your emails easily and safely without any data loss. I would recommend to all users to try Free Trial version of this application, in free version you can recover 100% emails and these recoverable emails you can see in preview items but cannot saved it. For saving these emails you need to register the full version license. You can use Outlook PST Recovery tool which is an advanced Recovery utility designed to repair and recover corrupt emails from Microsoft Outlook. The Outlook PST repair is uniquely designed to repair corrupt PST file and extract its items to a new importable PST. Yes, you can take scanpst into account to see the results. However, this free tool does not guarantee to fix detrimental errors of PST file as it is sort of superficial method. No wonder Outlook is best emails application but in spite of so awesomeness and enhanced features email deletion, or other PST file corruption continues to frustrate Outlook users. I too encounter many but thanks to Outlook PST Repair Software using which i was able to fix them. I want to refer another recovery software for Outlook (.pst) user's , So just try this third party tool which is Outlook PST Recovery Software because this tool is repair your outlook files data and quickly Recover PST file data to new PST file without any issues. You can easily repair MS Outlook PST files with free Outlook Repair utility that will help you to repair MS Outlook PST free of cost. This is totally free utility, using this no need to spend any money. 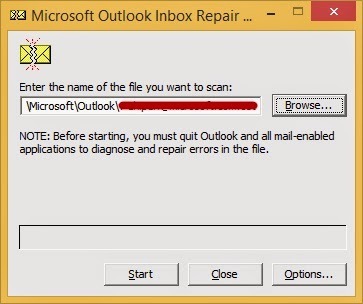 Read more details, here:- Repair Outlook PST Files.